The building known as “Powell Square,” located at Third and Cedar streets near downtown, was built in 1917 as the pharmaceutical factory of the John T. Milliken Chemical Company. 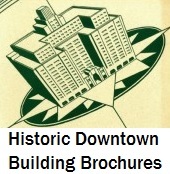 Later users included the Fulton Bag Company and Dan Powell Company, which both used the building for warehouse space. A company controlled by attorney Stephen Murphy has owned the building since 2001. Murphy, who owns neighboring buildings in the south riverfront area, planned to rehabilitate the building into artists’ studios and other uses, but eventually abandoned the project. On December 28, 2012, the Building Commissioner Frank Oswald approved a permit to demolish the building as an emergency order. The City of St. Louis is paying for the demolition, which will be billed to the owner. We asked local entrepreneur Ryan Albritton to discuss the demolition and what it means to the city. This entry was posted in Demolition, This Building Matters. Bookmark the permalink. There is only one reason to demolish under an emergency order when the building doesn’t pose a safety hazard. And that’s to get it down before it can be saved. I suspect many closed door discussions over Powell Square. It’s all fitting into some master plan they have for that area. I believe I read somewhere that the developer also bought the old Crunden-Martin plant and a couple of other buildings around Powell. Yay, More crappy condos and Yuppie bars! I’m usually a strong supporter of preservation and redevelopment, but I’m not seeing this one. When a building like the Century Building is torn down, I feel the loss. What was once a grand building still retained most of its architectural character and could have shined again. But Powell Square, even in its heyday, was nothing to write home about. It has always been a plain, unadorned warehouse-type building. Any redevelopment of this structure would have amounted to constructing a “new” building on the old foundation and structural supports. If you’re going to do that, why not just tear it down and build a new-new building? Any defense of Powell Square relies on an ethic of “if it’s old, it’s historic and must be saved” regardless of its architectural merit. Due to the previous demolition of its windows, it was not eligible for historic restoration tax credits, so no project would have been economically viable. I think the city made the right move here. Your assertion about redevelopment involving a “new” building really does not make sense. Redevelopment of the building would have entailed rehabilitation, not reconstruction — the shell was sound, solid and affordable to adapt. There is no need to take a building like Powell Square and rehab it all at once, either — a smart developer could have closed up the shell and rehabbed the building in zones. That is what Larry Deutsch is doing with the old Laclede Gas Building downtown. As for historic tax credits, the final plan for Powell Square did not even plan on using them, so their lack of availability was not a death sentence. Powell Square had no significant structural problems, making it a lot more likely to get rehabbed without tax credits than older, more compromised timber-framed buildings like Cupples 7. More likely will be a sea of vacant lots with large liens against them.